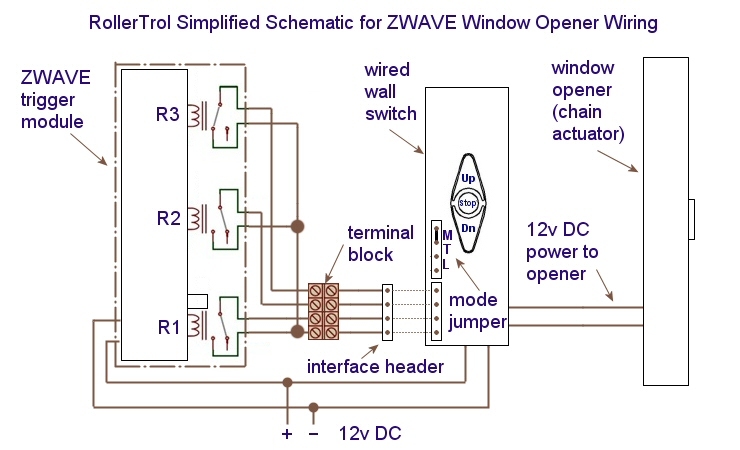 FAQ: Can I use ZWAVE to open and close windows? 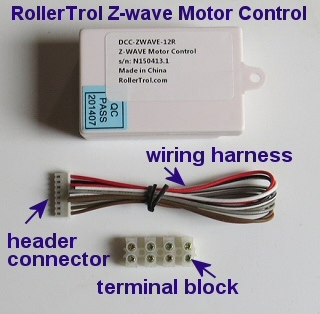 Our ZWAVE® shade and blind motor controller (DCC-ZWAVE-12R) can be also be used to activate our window and skylight motors using our wired wall switch. In the first article in this series, we looked at the operation of the ZWAVE interface receiver module that can act as a trigger to control various devices. In this second article we will show you how you can connect it to an interface switch to control window openers and other DC motors and devices. You can use it with any Z WAVE hub, such as Wink, SmartThings, Vera, Homeseer, Syslink, Zipr, Xuan, Razberry Pi, Staples Connect, Fibaro, Xuan, Homelive, Isis, Nexia, etc. The ZWAVE radio control signal is also capable of passing through walls and in most cases can reach anywhere inside a typical home. It is a true mesh network, as each module also acts as a repeater, passing control signals on to adjacent zwave modules. This article discusses the operation of our window and skylight motors, but you could just as easily use this system to operate our motorized irrigation valves. 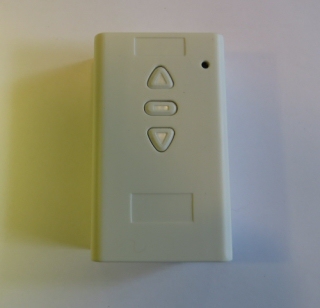 We connect the ZWAVE trigger module to our wired wall switch which controls the DC voltage and reversing polarity of the motor feed, providing open/close/stop functions for our unobtrusive chain actuators that open and close windows and skylights. These units use an interlocking chain that emerges from the housing at a right angle as the window opens, and they are very uncluttered when the window is closed, blending into the window sill. 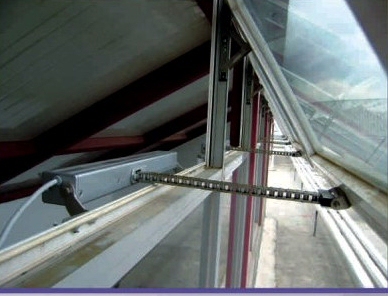 The actuators can also be used to push/pull anything you like, they are not limited to window and skylight applications. We've had customers use them in all kinds of different ways: raising and lowering TV sets, projectors, panel doors, etc. The wired wall switch can also be used as a simple ZWAVE on/off switch for devices that do not require motor reversing: fans, LED light strips, irrigation valves, etc. In the first ZWAVE introductory article we looked at the basic functionality of the z wave controller. Essentially it has 3 single pole, normally open relays that are operated directly by the zwave control signal. A relay is a simple electronic switch, not much different from a regular wall light switch, except it uses magnetism (generated by a DC current flowing through a coil of wire) to close and open the contacts. Here we have taken the schematic shown in the previous page and rotated it 90 degrees so that we can expand the diagram horizontally. 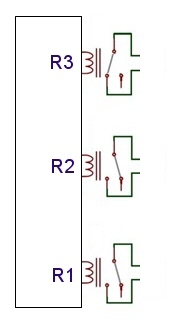 You can see the 3 relay representations of R1, R2, and R3 clearly in the schematic diagram. As before, R3 is shown in the 'closed' position where it completes a circuit, just as you would flick a switch to close a circuit and turn a light on. R1 and R2 are shown in the 'open circuit' position, which is their 'normal at rest' state when they are not activated. We will be using these 3 switch closures to trigger the wired wall switch, which in turn controls the window opener. In the diagram below, we have added the wired wall switch and window opener to the wiring diagram. The dots on the wire path indicate spots where the wires are actually connected, and not just crossing each other. You should be able to see where the 3 solid color wires from the bottom side of each relay connect together to form a common ground. When the relays close, the circuit to ground is closed, which is what activates the switch via the header. In fact, these relays are actually connected in parallel with the push button switches on the wired wall switch, and the relays do exactly the same thing as if you had pressed one of the switch buttons - close the circuit to ground. This action activates a transistor circuit, which in turn controls the output of the switch accordingly, activating the window opener. Power: The red and black ZWAVE module wires are for power (red: +12v and black: ground). Note that in the picture there is a second set of wires inserted into the screw adapter for the power supply. This parallel connection will power the wired wall switch, so that both units share the same power supply. The current draw of the ZWAVE module is quite low (~25 ma), most of the power goes to the wired wall switch which then powers the actuator, which can draw up to 2 amps. Switch Mode: The wired wall switch has 3 operating modes: momentary, latched, and toggle. The momentary mode should be used to avoid contact bounce issues (see mode jumper setting in picture above), and the zwave trigger relays should be set to hold the wall switch on for the duration of the window opener travel, typically around 30 seconds. The zwave trigger timing can be up to 255 seconds (about 4 minutes). Here's a picture showing how the female header cable mates with the 4 pin male header on the wired wall switch board; we've added the actuator (window opener) and the power supply, which completes the package. This is what is in Window Opener Kit #1 (click to open in new window). 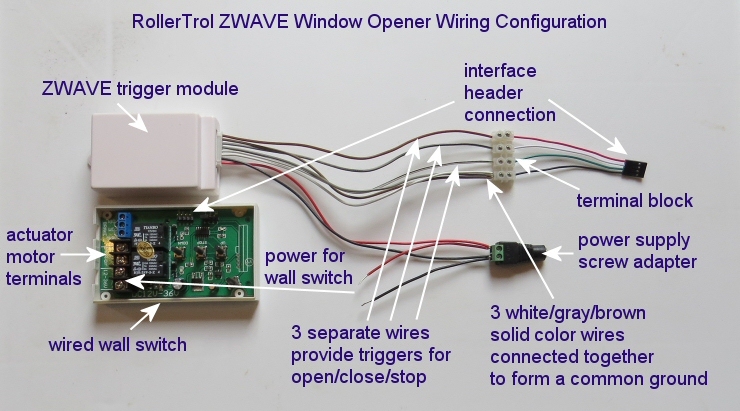 This system can control a group of window openers connected in parallel, up to the 10 amp capacity of the wall switch (about 4 or 5 actuators, depending on load), provided you upsize the power supply output capability accordingly. You could just as easily use this to control an unlimited group of our radio blind and shade motors (as per next article), or a group of our non-radio motors, or any other 12v DC device (LED strip lighting, fans, valves, etc). In the picture below, you can see what the wired wall switch looks like installed on a wall. Everything else from the picture above can be concealed, and you could also conceal the wall switch if you didn't care about controlling the window opener manually. 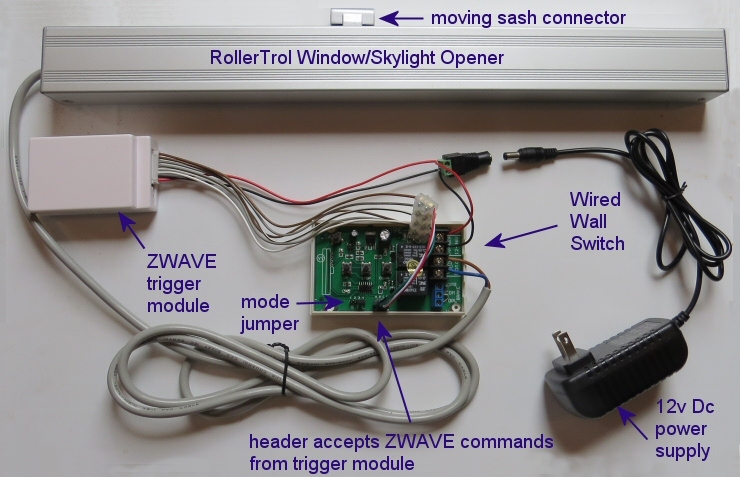 In the next instalment, we'll show you how to connect the ZWAVE trigger device to the radio wall switches that provide control over our shade and blind motors, including our very popular remote control blind motors with a built-in battery (and 'in window' solar charging option).